This year’s Vedanta AGM was preceded, as usual, by a vibrant and noisy demonstration organised by our friends at Foil Vedanta – one of a series of demonstrations against the company organised also in India and Zambia. The company made the task of organising the protest easier this year by arranging a venue – Ironmongers’ Hall – which enabled us all to gather in a circle and greet arriving shareholders in an appropriate – if perhaps not altogether affectionate – manner. Figures wearing face masks of Vedanta Chairman Anil Agarwal and Vedanta Chief Executive Officer Tom Albanese conducted periodic wrestling matches to portray perceived tensions within the company’s board. Inside the AGM, Anil Agarwal performed to his usual standard, going off on tangents, answering questions that nobody had asked and often failing to answer the question that had been asked. Perhaps he is slipping a little – he did not harp on, as in the past, about how India is the world’s largest democracy – but he did mention repeatedly that there are 1.2 billion people in India, whether or not this piece of information was relevant to the matter at hand. However accurate his grasp of Indian population figures, Anil Agarwal’s grasp of other aspects of reality – including the negative impacts of the company’s operations and its economic prospects – gave the impression that he is living on some other planet. Mars is just a guess – it might just as well be Pluto, though the travel time to the AGM would, of course, be greater. Tom Albanese looked much more than a year older than he had at last August’s AGM. The strain of working for Vedanta is showing. Given the man’s demonstrable concern for worker safety and obvious attempts to improve Vedanta’s appalling record, one may almost feel tempted to feel sympathy for him. Company Chairman Anil Agarwal began the meeting by introducing Ekaterina Zotova, sitting at his right hand, as a new director – the latest person to be persuaded to destroy whatever reputation she might have had by association with this company. Anil Agarwal used his address to sing the praises of the company. He said that the company will be able to take advantage of the five billion people, a third of them Indians, who will apparently join the world’s ‘middle class’ in the next few years. (He did not speculate about how long the planet can continue to support the consumerist lifestyle of the world’s middle class before ecosystem collapse, rising sea levels, water shortages and extreme weather events lead to the apocalyptic end of civilisation as we know it, but perhaps this is not a consideration for anyone fixated on short-term financial profit.) India, he said, needs many more mineral resource companies like Vedanta to supply its growing economy. Agarwal said that Vedanta is very supportive of Indian Prime Minister Modi and his government. The company is one of the largest employers in the country. It contributed 4.6 billion to the countries in which it works – he did not say 4.6 billion what, but we can perhaps assume he meant dollars rather than, for instance, cabbages, worker deaths or environmental disasters. He predicted that the company would be strengthened by a merger with Cairn India. This will create significant value for both sets of shareholders. Vedanta is, apparently, bringing economic empowerment and social mobility to four million people. It is well positioned for the next stage of growth. Health, safety and the wellbeing of its 82,000 staff (down from 88,000 last year, according to the figure announced at last year’s AGM) is very important to Vedanta, and the company aims for zero harm. There have been fewer fatalities this year but the company will not be satisfied until zero harm has been achieved. Agarwal thanked shareholders and governments for their support. A year ago, Tom Albanese had been struck by the potential of the company. Progress had been made on priorities over the past year, including simplification and commitment to sustainable development. Sesa Sterlite had been renamed Vedanta Ltd, in response to the workers and shareholders who requested it. The merger with Cairn India Ltd should take place in 2016. There will be benefits from being part of a large group. There is increased financial flexibility to allocate capital and sustain strong developments. Vedanta has continued to create value despite the volatility of the mining and energy industry. Its long life, low cost assets have benefited from investment and now from production increases. It is well positioned to increase growth. The largest zinc mines in the world are at Zinc India – and there has been record production of zinc and lead. Copper India has achieved its highest ever production. There are power issues in Zambia but progress is being made at KCM. Iron ore production has been recommenced at Karnataka and he expected it to begin again in Goa at the end of the current rainy season. He explained the process of safety training in Zambia, which has apparently led to great improvements. He said that the company is committed to respecting Free, Prior Informed Consent (FPIC) in India. This came as a great surprise to me, as I had formed the impression, perhaps wrongly, that it is doing everything in its power to undermine and circumvent the overwhelming verdict of Indigenous Dongria Kondh communities in the Niyamgiri Hills, who have repeatedly and categorically rejected the company’s plans for mining in the area. The company, he said, has also set sustainability targets. It creates jobs and supports community projects. It continues to work on human rights, to close any gaps between its performance and UN standards. “It is imperative that we continue doing this in all the communities where we work,” he said. Vedanta will continuously improve its environmental performance, its efficiency and its costs. When the commodity cycle turns, as it one day will, Vedanta will be well placed to take advantage of it. Mining researcher Roger Moody was called next. Anil Agarwal said, “Here’s our friend! Nice to see you!” I suspect that this may have been another example of polite dishonesty. In any case, Roger said he could not reciprocate. Roger noted that Tom Albanese had repeated the mantra of ‘no harm’. Addressing Tom Albanese, Roger said: “No doubt you personally believe that this is the most important objective of this company, and you have done a lot of work, but eight fatalities are eight too many. In the presentation you gave, the first case example was taken from Zambia, claiming that that particular operation has had a reduction in fatalities. But there were three or more fatalities at KCM last year, which does not square that well with your presentation. I would extend zero harm to include zero pollution, and your presentation sits uneasily with the article in The Observer yesterday about Leigh Day and Co presenting a case on behalf of 1,800 people in Zambia for medical conditions that you brought on through polluted water. “A year ago you made promises in regards to worker safety. If I remember correctly, you said that you plan to link directors’ remuneration to best environmental and safety results. The Annual Report makes no reference to this in the section on remuneration. Please point to the reference if I have missed it. Tom Albanese then said that, with regard to the Leigh day case, it was important to recognise that Vedanta had received a letter about it the previous Friday and had not yet been served notice so it is difficult to answer specific allegations. He could confirm that the company had received a letter on behalf of a number of claimants. Until they received the official notice he could not comment. Vedanta would be seeking further information from Leigh day and their clients, and could respond once that had been received. Until then, any court proceedings are premature. All Vedanta subsidiaries take community well-being and environment seriously. KCM has been around for about 70 years. When Vedanta acquired an interest about 10 years ago, the mine had less than ten years of resources left, and the facilities were outdated. Vedanta had invested in underground facilities and 230 million dollars of zero discharge equipment so that water would continue to be available for agriculture and drinking. The company had invested in new pumps for desilting and slurry. It had made a remarkable difference. It had reduced total solids in discharged water by 75%. It had invested in sulphur capture equipment. It had invested over 530 million dollars in refurbishing decay tanks, resulting in zero discharge from the dam. Roger said that, according to the Observer report, Canadian engineering company SNC Lavalin was employed to advise Vedanta, and the engineers’ report recommended 17 actions to be taken. He asked which of these had been taken. Had Tom Albanese received the report? Tom Albanese replied that when the company had been served notice of the legal case, he could answer the question. Roger said that the question was whether the company had received the report from the engineers that it commissioned to look into the practices at KCM. Tom Albanese repeated that when the company received notice, they would look into it. He then moved on to the questions about Korba. He said that there are four different findings which are before the Indian High Court and that Vedanta had to respect Indian judicial proceedings. Film-maker Simon Chambers called out that Vedanta was not helping the process by repressing the findings of the Bakshi report. Roger pointed out that Vedanta is a British company. If another British company had experienced such a disaster… But at this point, Anil Agarwal interrupted him, saying that he had visited the families of everyone killed in the chimney collapse. There was then an argument, Anil Agarwal speaking over Roger Moody and making it impossible to hear what was being said. At last, Roger was able to make himself heard again, and asked whether the company had made any response to the Early Day Motion in the UK Parliament. Had any respect been shown to the concerns of the MPs? Another shareholder said that the share price had come down below the flotation price. Why was this happening? Vedanta is suffering more than other companies. Despite financial problems, Vedanta had invested 42 million in community programmes. This was essential. But how did the company do it? Did it give money to other organisations or did it have its own foundations? How is the money monitored? Another shareholder complained that every year there was “some pressure group outside or inside. Is this because some competitor is financing them?” he asked. “Human rights organisations should not come and take up investors’ time,” he asserted. I found this intervention extraordinarily unpleasant. Shareholders at some AGMs express genuine concern at the human rights issues raised – and these concerns are not (though this was dealt with publicly later) being raised because anyone is being financed by the company’s competitors, but out of a sense of solidarity with fellow human beings suffering as a result of corporate operations. And as far as I know, none of us critics was being paid by anyone to be there! The next questioner said that the company gets a lot of negative press. There is also concern about the company’s ability to service its debt. He asked what the board proposed to do about press coverage and about debt? He said that the share price had dropped 80% in the last four years, much more than other mining companies. What steps would the board take in the next twelve months to protect share value? I should say at this point that acoustics in the lofty Ironmongers’ Hall are poor, and I was sitting right at the back, and there were interventions which I found a trifle difficult to hear clearly. It may be that I misheard what was said. But, as I understood it, we were being told that changing the colour of the company’s logo from orange and blue to green and blue was a good start to transforming the company’s image in the media. Never mind spillages, worker deaths, multiple law suits or any of the concerns being raised with such tenacity, year after year – we’ve got a new logo, and it’s got some green in it, so that’s alright, then. I will refrain from further comment. There was some further discussion about share price, assets and bankers. My attention wandered. Then a shareholder as big-hearted as the one who had suggested that the company’s critics were being paid by its competitors (actually, it could have been the same man…) said crossly that shareholders should not be allowed to ask too much about human rights. How splendid it is that the UK Government believes that, rather than loading companies with too many unwelcome regulations, it should encourage shareholders to exercise greater vigilance over the companies which they partly own! With shareholders like these, the market could then really rip! Just stop people from asking inconvenient questions about worker deaths, Indigenous Peoples’ rights or polluted water! Samarendra Das, from Foil Vedanta, said that he wanted to repeat a few questions that the board had said it would answer last year about Goa. He said: “You were accused of taking too much iron ore. We understand that not all the Goa iron ore leases have been renewed. Can you tell us how much reserves and annual production has not been renewed so far? “The Supreme Court judgement on Goa had ruled that all leases expired on 22nd November 2007, and any mining after that was illegal. Mining stopped on12th September 2012, implying nearly five years of illegal mining. The mining law in India provides for recovery of the full value of the mineral, plus 24% interest. What is the potential liability on this account? The lease renewals have been challenged. If the renewals are struck down, what is the potential additional liability? Tom Albanese replied that the Indian Supreme Court ruling on mining in Goa was that the ‘deemed approvals’ by the Goan state government in 2008 were not acceptable. There needed to be an actual approval process. Since the last Vedanta AGM the Mumbai court had said that the state needs to deal with this and that the approvals could last till 2027. Vedanta had sent in applications and paid stamp duty payments so it had taken the action it needed to take, and state the government had not taken the action it needed to take. The state government has now taken active action to approve the deemed leases and extended them to 2027. The government reserves the right to re-auction them at that time. With these approved leases in place, Vedanta is going through an approval process which would enable it to mine from October, up to 5.5 million tonnes a year, which is within the court-imposed cap. Tom Albanese had been to Goa twice in the last two months and it was clear to him that the people of Goa were looking for jobs and looking forward to a resumption of mining, but in a more controlled way. Instead of any word of support for the victims, there was then a further interchange between various shareholders and board members about share price valuation and bonuses. 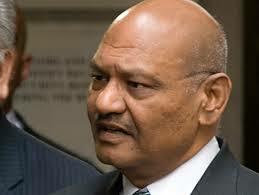 Anil Agarwal said that it was very good that people were asking about the share price. He said that the simplification of the company should lead it to a better situation: costs would come down. I suppose it is so much easier to deal with questions about money than these pesky, irritating questions about human rights and environmental destruction. Simon Chambers moved on to this very matter, answering the question raised earlier by the shareholder who seemed to think Vedanta’s critics are all being paid by its competitors. Simon said: “We are not paid by competitors.” He explained that we raise questions at the AGM “because we are asked to do so by people in India and Africa who cannot come to the AGM to ask questions on their own behalf.” He then said that he wanted to come back to the question of the Korba disaster. Tom Albanese said that there had been a 20% reduction in aluminium pricing (actually, he called it ‘aluminum’ pricing, but that’s okay…) so Balco needs to work very hard to stay viable. Vedanta needs to make sure it can survive. Chinese aluminium was being exported to India and undercutting Indian production. It is a struggle for business survival for Balco. It will have a huge effect on the community if the company does not get this right. The board wants to make sure the business can survive in whatever conditions the market throws at them. The land that Balco has acquired is the same land that was there at the original privatisation. There has been illegal land encroachment over that ten years. Vedanta did receive permission from the authorities for the expansion. Balco has been around for several decades and developed a huge legacy of relations between the business and the community. Simon said he was not sure they were talking about the same wall. Tom Albanese asked him to send a map. Simon said the company was also dumping dry ash on what is known as common land. That is illegal, and there are industry standards about dumping it under water and producing dry ash ponds. Hard times in the industry are not an excuse. Tom Albanese said that the government had laid down standards about fly ash. Vedanta has developed the capacity for dry ash to be used in concrete for road building. It is working on proper recycling of waste products. Simon asked whether any verdicts had been reached on any of the four Balco cases? Tom Albanese said no. A representative of Share Action asked a further question about occupational health and safety. She said she was pleased to see a fall in accidents from over 20 to eight, and congratulated the board on this even though, she said, it was far from acceptable. She repeated that the board had spoken about zero harm and said she was concerned about reports in the Observer and Reuters over the weekend about contamination of Zambian water supplies, and also about the protests outside the AGM. She noted that Vedanta had been ordered by the Zambian courts to pay fines over water pollution. How would the company manage the spiralling costs of legal action and how would the board answer the claim in the Observer that its policies are good on paper but not in practice? It was worrying if the board thinks that protest groups and human rights activists are being funded by competitors. It was pointed out that the case was based on a report that Vedanta had itself commissioned – but there was no further response. I then asked about the company’s Sustainability Report on page 36 of the Annual Report. This has a section on ‘highlights’ which notes that the company produced 40 million tonnes of CO2 equivalent in the past year as opposed to 37 million tonnes the year before. I said that I assumed that ‘highlights’ were aspects of the company’s record that it saw as good. In what way was an increase in carbon emissions good? Tom Albanese explained that the increase in carbon emissions had been due to coal use in energy generation. He said that the company was committed to reporting on things whether they make it look good or bad. I congratulated the board for the fact that, compared to all the other mining companies whose AGMs I attend, Vedanta is far ahead of all of them in making itself look bad. That actually raised a bit of a laugh, which may have been a blessing in the context of such an utterly dire AGM. But it is of no comfort to the many people suffering as a result of Vedanta’s operations. The struggle must continue!